Purpose To explicitly state the IR spectra in combination with the VCD spectra are excited by QED induced radiation allowing all molecules including enantiomers to be distinguished by the G-receptors inside the nose. 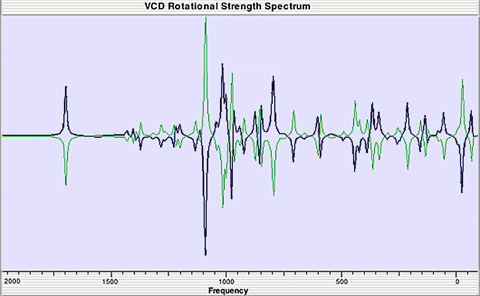 Analysis The odorant molecule has both normal vibration modes represented by its IR spectra including the rotational modes given by VCD spectra of circular dichroism. Like a laser, QED radiation excites all modes of the odorant molecule, the intensity of response depending on the participation of the mode with the laser excitation. Prior to collision, the temperature of the odorant molecule in the ambient air is near 20 C while the nose is at body temperature of about 37 C. Upon breaking contact, the odorant molecule now momentarily isolated from the nose surface cannot by QM conserve the absorbed kT energy by an increase in temperature, and therefore conservation proceeds by the emission of non-thermal QED induced radiation corresponding to its IR and VCD spectra. The odorant molecule by emitting its unique IR/VCD spectra therefore signals the G-protein that its species alone is inside the nose. Shape Mechanism Olfactory receptors need not be activated through binding of molecules with highly specific shape, although momentary or intermittent contact is required in the QED induced radiation mechanism to absorb kT energy from the atoms in the nose surface. But olfaction need not be involved. Of a more fundamental significance, Pauling's long standing shape-based molecular interactions are placed in question by intermittent contact with the QED induced radiation mechanism. Whether there is a need for the Marcus theory to similarly explain electron-transfer requires more study. Vibration Mechanism Luca Turin's argument that the G-protein-coupled receptors discovered were actually measuring molecular vibrations, rather than responding to molecular keys that work by shape may be extended to the combination of IR/VCD spectra signal of the odorant molecule by QED induced radiation. QM is involved, but not through the complex phonon assisted electron tunneling. QED induced IR/VCD spectra is a far more credible QM mechanism. In the QED induced radiation mechanism, transfer of the charge or electron to the brain is far simpler in that the signal from the odorant molecule will produce its own charge or electrons in the appropriate G-protein receptor by the photoelectric effect. QED induced radiation spectra is the same as Turin's odor character tuned to different vibration frequencies, but differs in that depending on the absorption of the odorant molecule in the FIR some odors are stronger than others at the same concentrations. Given that QED radiation provides the source of EM energy to excite the odorant molecule, the G-receptors like a spectroscope allow the odorant molecule to be uniquely defined. A causal relationship between the IR/VCD spectra and odor is therefore likely. QED Induced Spectra Unlike QED induced radiation, both shape and vibration mechanisms lack a source of EM energy for activation. To this day, lock and key mechanisms lack a source of charge. Similarly, the vibration mechanism requires a yet undefined biological origin. To activate charging in molecular interactions, phonon assisted inelastic tunneling or the like are proposed only because the phenomena lack a viable source of EM energy. In contrast, QED induced radiation provides molecular interactions with a source of EM energy accessed by intermittent contact with the thermal kT energy of other molecules. The QED radiation induced VCD spectra of the odorant molecule provide the G-receptor with a significant signal to distinguish between enantiomers.. Both shape and vibration mechanism of olfaction that are based on contact of the odorant molecule with the nose are superseded by the QED induced radiation mechanism that produces the IR/VCD spectra of the odorant molecule allowing recognition by the G-protein receptors..